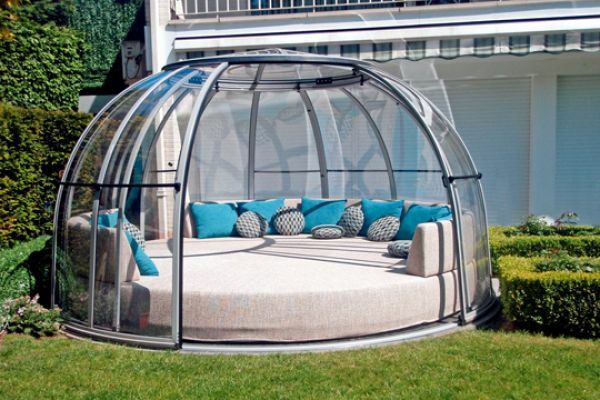 Our Patio or Garden Enclosures are very similar to our pool enclosures but can be attached to the side of your house or pub for example to provide shelter from bad weather but still enable you to be outside on the patio. People often refer to them as a sliding veranda, garden shelter, igloo, smoking shelter, conservatory or a telescopic conservatory. 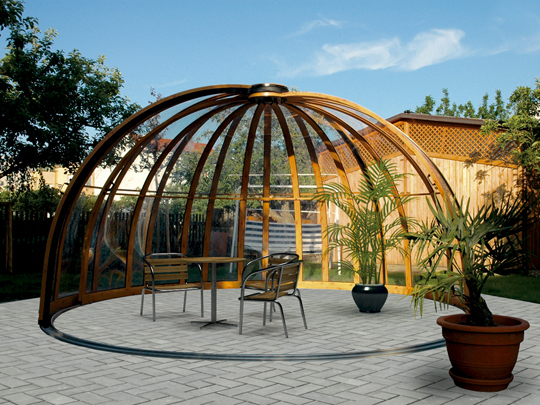 With so many amazing benefits, garden enclosures are a great investment, and we can offer high-quality enclosures at the best possible price. 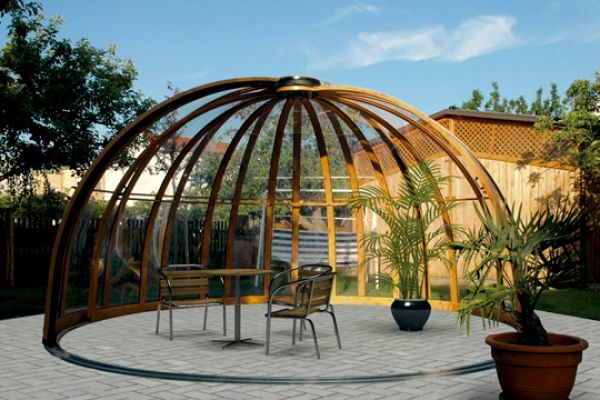 Whether you are looking for an enclosure for your spa, patio or pool, we have a wide range of different designs to suit. For more information contact us and someone will assist you with your queries. Aluminium sections developed especially for pool enclosures have a wall thickness from 1 to 3 mm, and are anodized or powder-lacquered (according to the RAL scale). The manufacturer (SAPA) is holder of the ISO 9002 certificate. We use 3 types of sections: 38×50, 60×63, 60×80 mm. 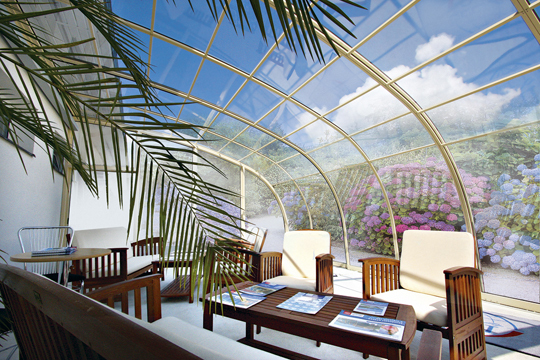 The longest aluminium sections enable us to make a pool enclosure with a width up to 9 m – the smallest segment. For the largest swimming pool cover structures, we use the Progres or Grande track with a height of 15 – 18 mm. The maximum segment width is 2,450 mm. 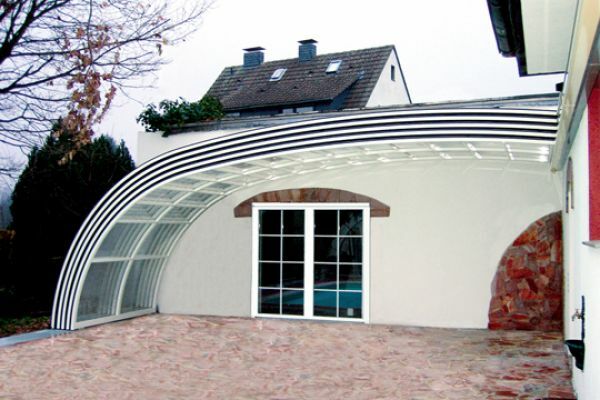 We use frame profiles specially designed for sliding swimming pool enclosures by our engineers. We have minimized the width of the visible framing to maximize the viewing area through the transparent wall panels and provide a clean, finished appearance. Mobile swimming pool enclosures are constructed with telescopic sliding segments. Depending on the option chosen, the segments may be moved independently in both directions or as a single synchronized telescopic system. The aluminium design with stainless steel fasteners is unaffected by the high moisture environment found within swimming pool enclosures. KOMFORT track with a height of 15 mm is used for swimming pool enclosures up to 6.25 m wide, for wider pool enclosures use PROGRES (height 15 mm) or GRANDE (height 18 mm). KOMFORT, PROGRES and GRANDE, – thanks to their shape, these tracks do not hamper movement of people around the swimming pool, and the small grooves on their surface prevent slipping. So as to reduce the width of the rails, it is possible to repeat segments. 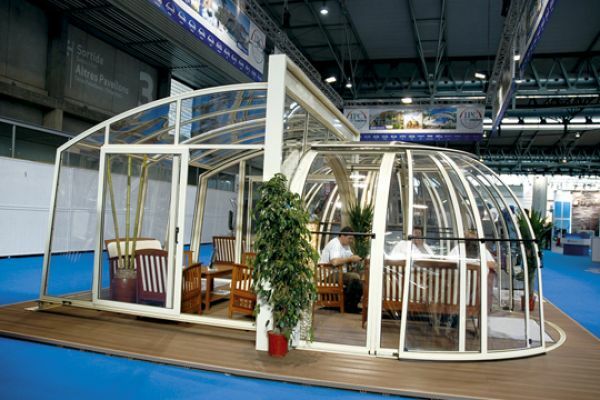 Only 1 model of swimming pool enclosure – Riviera, is without rails. A special track is used for the Orient circular swimming pool enclosure. The PROGRES or GRANDE track is an up-to-date and useful modification of the KOMFORT track. Its width is easily adjustable in dependence on the inclination angle of the travel profile. Track rails are attached to the concrete foundation or paving by means of plastic hammering dowels with a length of 8 mm. The number of dowels and their length depends on the construction readiness of the background of the rails. It is necessary to rinse out the rails with a flow of water before attaching them to the foundation. 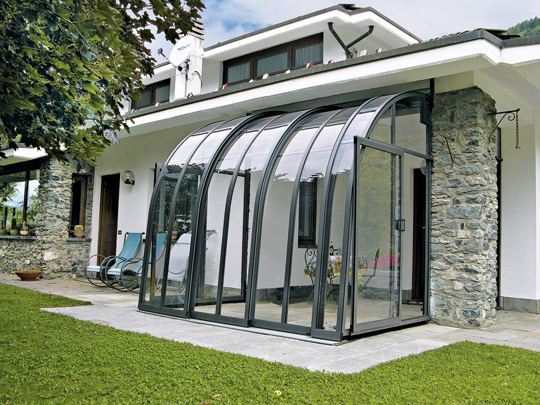 Polycarbonate - prevents distorting caused by climatic effects. The structure of the pool enclosure is filled with twin-walled polycarbonate: 10 mm, 8 mm or clear, compact 4 mm polycarbonate. 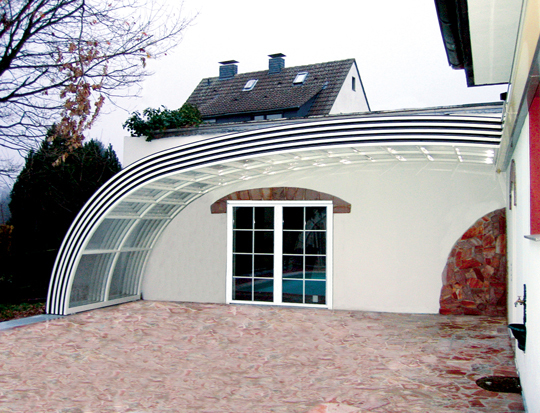 We use twin-wall or four-walled polycarbonate. 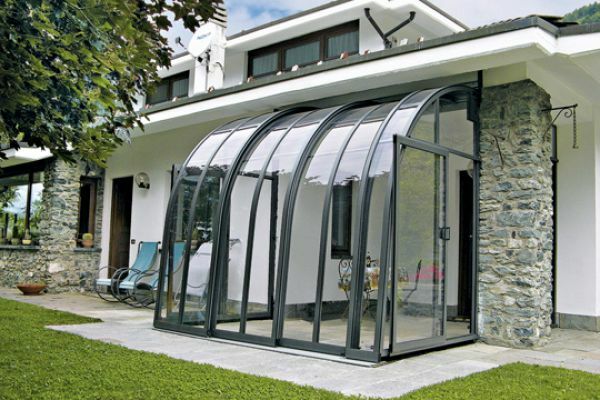 The polycarbonate filling causes the so-called greenhouse effect. Sunbeams dispersed in the atmosphere even on overcast days cause heating of the water and air in the swimming pool enclosure. At night or on cold and cloudy days, the water and air cool down more slowly. The outer surface of all polycarbonate boards is covered in a high-quality UV stabilization layer, which absorbs the effects of harmful UV radiation and prevents impairment, cracking and unwanted colour changes in the polycarbonate. 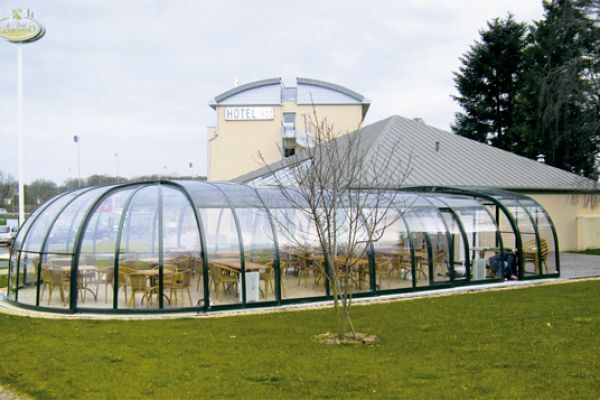 Properties of quad-wall polycarbonate used for production of swimming pool and spa enclosures. 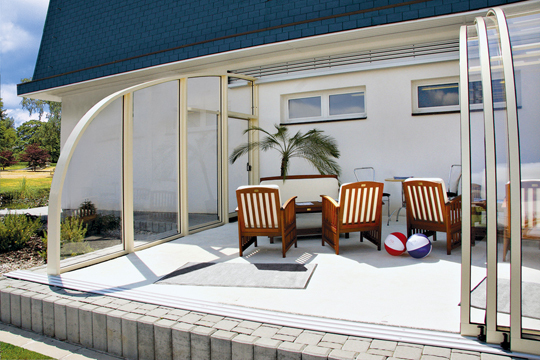 Quad-wall polycarbonate increases the thermal insulation by 13 % (in comparison with twin-wall polycarbonate). 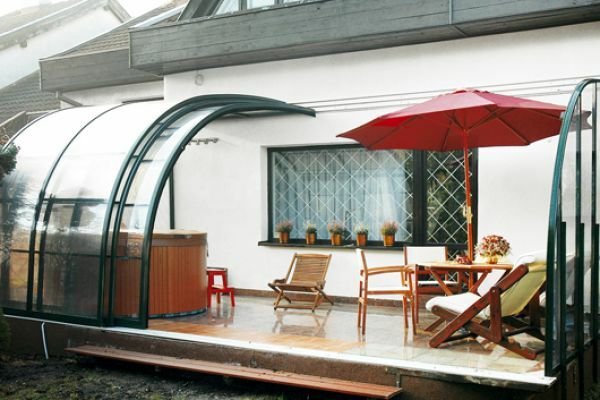 NO DROP invisible film applied on the surface of the polycarbonate makes condensed water flow down the walls of the pool enclosure quickly and effectively, so it does not trickle down. Thanks to this surface finishing, water flows down the inner side of the swimming pool enclosure. 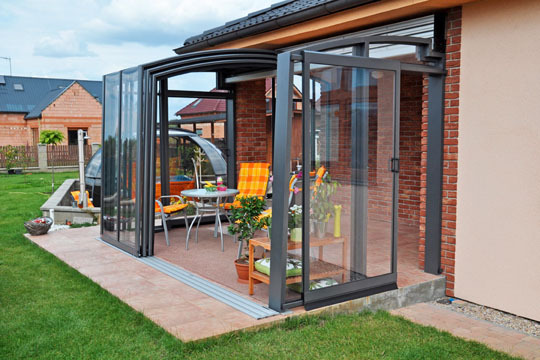 Four-wall polycarbonate is only supplied clear. 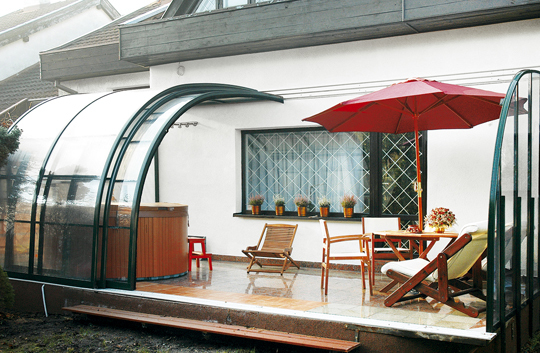 NO DROP invisible film applied on the surface of the polycarbonate makes condensed water flow down the walls of the swimming pool enclosure quickly and effectively, so it does not trickle down. Thanks to this surface finishing, water flows down the inner side of the pool enclosure. 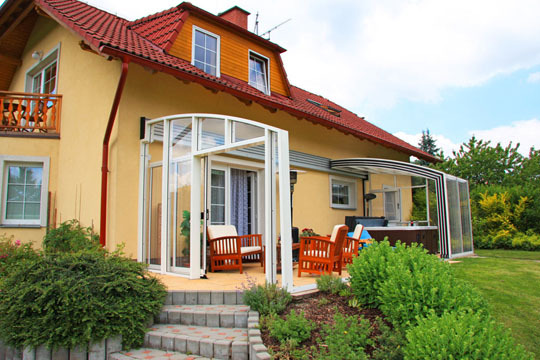 We offer 2 types of moving system: with rails and without rails. The tracks are made of anodized or powder-lacquered aluminium sections. The track is fixed to an even surface horizontally, vertically – on a wall of an existing wall. The number of rails of the track corresponds to the number of segments which form the pool enclosure. 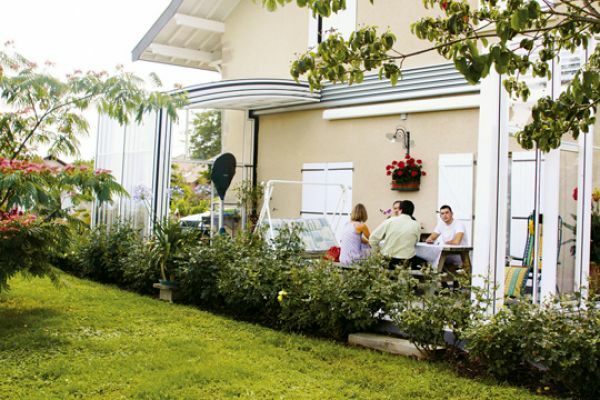 The pool enclosure may be equipped with a solar electric drive.